Should we call him "Little Daddy?" 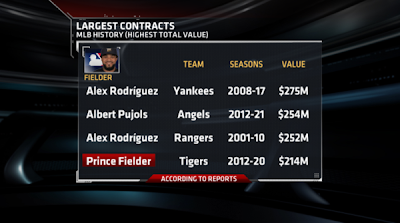 With the shocking news that Prince Fielder signed a 9-year, $214 million contract with the Detroit Tigers, many Detroiters are pondering that question with hundreds of others. "Who will play 1st base this season? 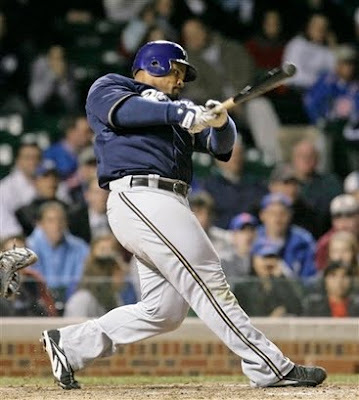 Miguel Cabrera or Prince Fielder?" "When Victor Martinez comes back to DH, does that mean Cabrera will have to play 3rd?" "Are the Tigers becoming the New York Yankees of the Midwest?" "Does this make the Tigers the best team in the American League?" "Detroit owner Mike Ilitch is going all-in to win a World Series. Will this do the trick?" There hasn't been this much buzz in Detroit since the 2006 World Series. 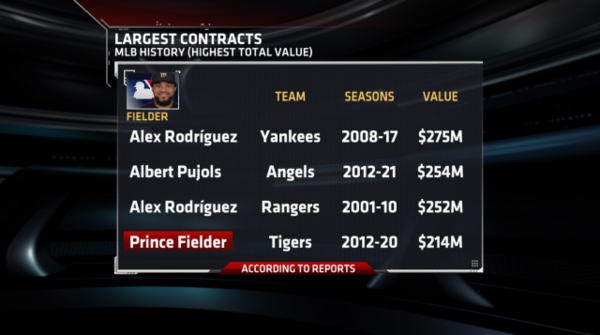 Most of that can be attributed to the Tigers showing they're willing to open the checkbook to compete financially with the Yankees and Red Sox of the world. When Martinez suffered a freak ACL tear a couple weeks ago, it was doom and gloom. Detroit needed to find a replacement for arguably one of the best switch hitters in the game and someone who could protect Cabrera in the lineup if it wanted to keep its hold as the team to beat in the AL Central. Fielder was always a "never going to happen" move because he wanted a long-term deal and, with the current roster, the Tigers likely couldn't offer more than a 1-year contract. I had been clamoring for Detroit to offer Fielder a 1-year deal worth anywhere from $20-$30 million because, the peacemaker that I am knew it would have been a win-win for both sides: Fielder gets a big pay day and then, when the Tigers don't need his services for V-Mart anymore, it would allow him to hit the free agent market when teams like the Dodgers could pony up $200-plus million. I supposed Ilitch, 82, desperately wants to win a World Series in his lifetime. That desire made him feel more than comfortable to offer Fielder a 9-year deal with an annual salary of $23.77 million. 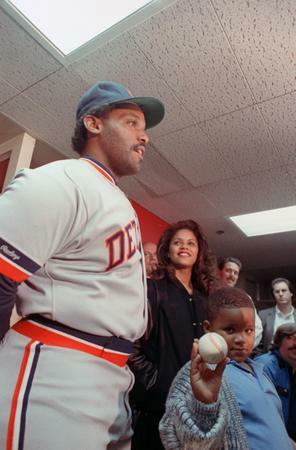 Now, "Little Daddy" will man the position his father, Cecil Fielder, played for the Tigers from 1990-96. It was Cecil "Big Daddy" Fielder, however, that was the main reason most speculated Prince would never come to Detroit. Due to his Cecil's gambling problems, money issues became the root of his parents getting divorced. The $47 million Cecil earned in his playing days evaporated. Most of it disappeared in casinos while other millions were lost in bad investments. The situation finally erupted when Cecil took $200,000 of Prince's MLB signing bonus. The father and son weren't on speaking terms for years. While time has healed some wounds and Cecil and Prince have spoken recently, the wounds aren't those that can be covered by a band-aid; we're talking about knife wounds resembling that of a stabbing victim. Maybe coming to Detroit is a major way to begin the healing process. BRONX BOMBERS, MEET THE MOTOWN MASHERS? Now the fun begins for Tigers Manager Jim Leyland and his lineup. Leyland was maligned much of last season, more so in the early part of the season when the many thought the Tigers should have been running away with the AL Central rather than flirting with the .500 mark. Some of the criticism was unjustified as Leyland dealt with injuries to Magglio Ordonez and Brennan Boesch. 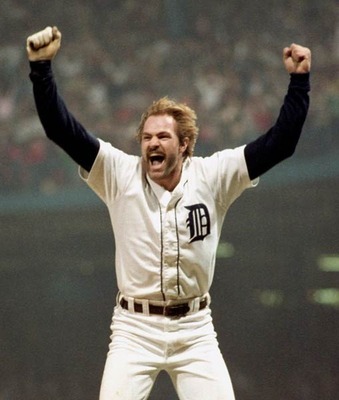 However, Leyland's refusal to move Cabrera out of the 4-hole when a top third of the lineup featuring Austin Jackson, Ryan Raburn and Ordonez continually went out 1-2-3 in the first inning was just one of the decisions irking Tigers fans. Worse, when Ordonez needed a rest, Leyland would plug Don Kelly in the 3-hole instead of moving Cabrera up a spot. Most likely, this cost Cabrera a few dozen plate appearances over the course of the season. There were also those games when seemingly the entire starting lineup needed a rest and Leyland obliged by sitting four starters with Brad "Gas Can" Penny on the mound. It was Detroit waving the white flag before the first pitch in many Tigers' fans' eyes. With Prince, Leyland can grab a permanent marker and write Cabrera on the No. 3 line and Fielder on the No. 4 line. While the lineup looks golden, especially because it alternates R-L-R-L-R-L-R-S-R (Santiago would bat lefty when a right-handed pitcher was on the mound), I would rather Peralta have more at-bats than Boesch. Peralta has shown he can hit and, more importantly, put the ball in play. Boesch's ceiling might be higher, but until he can perform at a high level for an entire season, I would rather Peralta get 40 more plate appearance over the course of the season. It should also be noted that Ryan Raburn would alternate with Santiago at 2B while Don Kelly would split time with Inge at 3B. Regardless of who starts, that quartet should make up the 8- and 9-hole in every lineup. Nothing is certain, especially coming off a season when the St. Louis Cardinals flirted with mediocrity all season before getting hot, snapping up a playoff spot on the last day of the regular season, and then, improbably, winning one of the greatest World Series in history. The Yankees and Red Sox have shown throwing money at players doesn't equal championships. 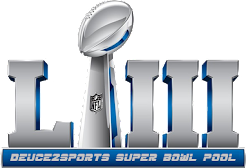 What it has shown, however, is an ability to compete for titles by making the playoffs. The Tigers were already the team to beat in the AL Central. The White Sox are rebuilding while the Indians still lack the offense and deep pitching staff to compete for a full year. The Twins are always sneaky but haven't done much to a team that struggled all of last year. It would appear the Royals - yes, those Royals - are Detroit's biggest competition this season. Kansas City's offense will be something to watch but a 1-2-3 starting rotation punch of Luke Hochevar, Jeff Francis and Bruce Chen doesn't scare anyone. Detroit should cruise to the AL Central title where it'll battle with the following teams to reach the World Series (in no specific order): Yankees, Red Sox, Rays, Rangers, Angels. Any given day could produce various results. The Rangers look poised to reach the World Series for the third-straight season while the Yankees' acquisition of Michael Pineda might be the missing link to another title quest. Don't sleep on the Rays either. With its potent offense and 1-2-3-4 rotation of Justin Verlander, Doug Fister, Max Scherzer and Rick Porcello, Detroit will compete with any team. Don't chain yourself to the "World Series Championship or Bust" mindset just yet. Prince's 9-year deal coupled with the other pieces locked up in Detroit for the next handful of years means Tiger fans should be able to celebrate relatively soon. With expectations sky high for 2012 a letdown is a major possibility. If that happens, there is always 2013 when - gasp! - Victor Martinez gets added to the lineup. Enjoy the ride, Detroiters; this is only the beginning of what will be remembered as Detroit's Roaring Teens. This "all-in" (unlike the white sox "all-in" last year) gives the Tigers at least a good 2-3 years to seriously compete for a title, and it's a great time as the rest of the division is relatively weak. Royals are likely the biggest competition, but are still about 2 years away from contending. The AL playoffs should be interesting with so many stacked teams this year - if I had to pick I'd go Tigers, Yankees, Red Sox and Angels in the playoffs.